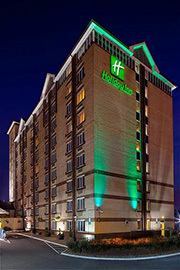 Receive a warm welcome at the Holiday Inn Slough-Windsor, a great choice from the hotels in Slough. Close to Heathrow Airport with good transport links to central London, you can enjoy Windsor Castle, Legoland and More. It’s just 15 minutes’ drive to the modern Holiday Inn Slough-Windsor from nearby Heathrow Airport. We have plenty of space for you to park your car and you’ll be greeted by friendly staff in our welcoming Lobby. As one of the hotels near Heathrow Airport with parking we have some excellent Park and Fly offers. We’re also just 2 minutes from the M4 and 2 miles from Slough train and bus stations making getting to London city centre a breeze. Make yourself at home in your spacious, newly refurbished, air-conditioned bedroom at Holiday Inn Slough-Windsor. You can check email with high-speed Internet (for a nominal charge) and browse channels on satellite TV. Help yourself to complimentary cups of tea and coffee. All rooms include iron and ironing boards, trouser press, air conditioning and high speed internet. As an Elite IHG Rewards Club member, you can now enjoy Free Standard Internet in all IHG hotels around the world. Upgrade to an Executive room which has an in room safe, mini bar, bathrobe and slippers, enhanced toiletries, chocolates, mineral water and magazines. You can book one of our 4 specialist meeting rooms with wireless Internet for Slough conferences of up to 40 delegates. Holiday Inn Slough-Windsor is 5 minutes’ drive from Slough Trading Estate, home to major companies like O2, Orange and Fujitsu. Holiday Inn Slough – Windsor has recently completed a refurbishment of its bedrooms, which are now decorated in a subtle and stylish theme, with upgraded air-conditioning. Relax with a drink and a bite to eat, in an informal and friendly atmosphere of The Brassiere Restaurant. For the most important meal of the day – Breakfast, you can enjoy our full English breakfast in the restaurant area, available daily from 6.30am to 09.30am weekdays and 7.30am to 11.00am weekends. You can dine with us in the evenings at the Slough hotel with modern International cuisine being served in the informal and comfortable atmosphere all day until 22.00pm. The bar area is open all day to both residents and non residents, so why not meet friends and family for a catch up, or if you need to do some work or just want to surf the web you can with Wi-Fi in the Bar.